For decades, every year, thousands of Kundalini Yogis gather in conscious community to celebrate the Winter Solstice in Lake Wales, Florida. This international celebration includes kundalini yoga classes, kirtan, and day-long partner meditations to raise consciousness and health by connecting with the Infinite. 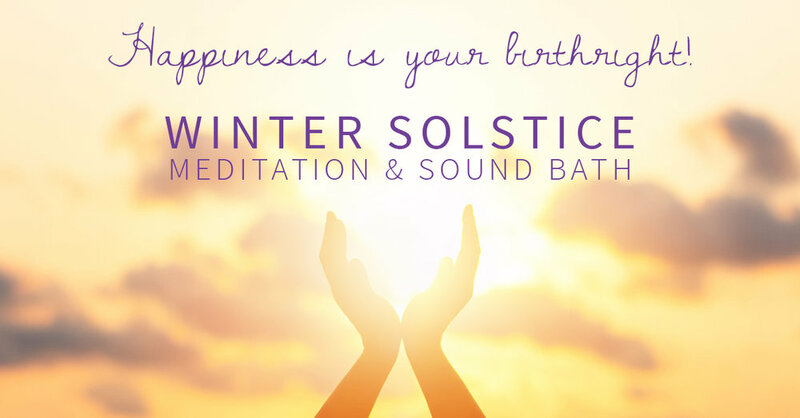 Our mini-Winter Solstice includes a lite short kundalini yoga practice, followed by a full hour of multiple meditations focused on claiming happiness as your birthright. hrough participating in 3 to 31 minute meditations, you may discover that, as Yogi Bhajan said, Happiness is your birthright. It cannot be taken away from you. After meditation, relax with a gong and crystal bowl sound bath. Our time ends together with connecting in community with tea and light snack. For this special occasion, it’s strongly recommended to wear all white clothing. A head covering is encouraged. Bring a yoga mat, meditation cushion or pillow to sit on (A few mats, blankets and bolsters available to borrow. ).